This beautiful ivory satin gown has exquisitely detailed sequins with a gathered bodice for a flattering fit. It is size 12, but has a corset back to allow room so will easily fit up or down a size. It is floor length and has a small train. 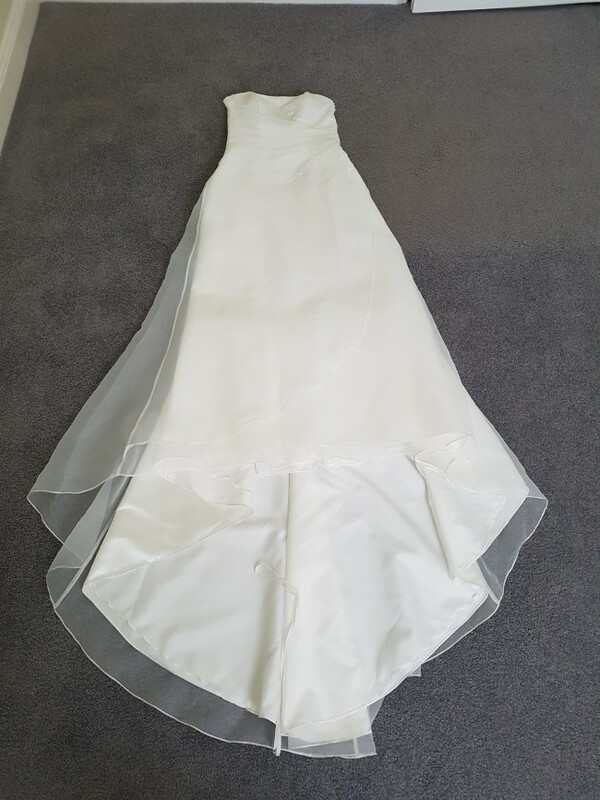 it is made of ivory satin with a chiffon overlay. The dress can be worn strapless, with shoe string straps or there is sequined fabric to make cap sleeves. It also has a shawl that can be used to make a veil. The dress has never been worn only tried on. It has had no alterations. I am also including a stunning purple satin complimenting bridesmaid dress that has also never been worn. It is in the same style as the wedding dress, complete with corset back. It is size 10 but again it could go up or down a size given the adjustable back. There is also stunning bride and bridesmaid bouquets and buttonholes for the groom and groomsmen.